► No Software ► No Pay Per Click ► No Link buying ► No Social Media ► No Press Release ► No time consuming ► No costs to execute ► No junk referrers, spam, bots, or black hat tricks ► NO ESTABLISHED TRAFFIC OR PAGERANK REQUIRED ► You can execute this in under ONE HOUR. Do you want to discover how? About a year ago, I tested a theory on one of my eCommerce clients sites, a brand new domain with no PageRank or backlinks, and no marketing budget. The results were mind-blowing! 98,000 unique visitors in 3 days, and HUNDREDS of backlinks from reputable HIGH PR/HIGH TRAFFIC sites. Some of these links appeared on page one of Google the SAME DAY. Within TWO WEEKS the site had about 100,000 visitors and it still continues to get 2,000 - 3,000 monthly visitors a YEAR LATER!! EXTRA FAST DELIVERY! Instant Download after your order! 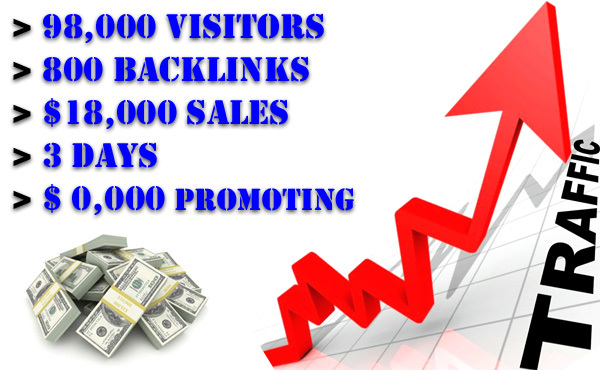 show You How I Easily Got 98000 visitors,800 backlinks,$18,000 Worth Sales in 3 Days with $0 budget is ranked 5 out of 5. Based on 31 user reviews.